For the last two years, DC Comics have been publishing various series based on Hanna-Barbera cartoons, and a variety of professional fear-mongers and clickbait publishers have been getting worked up about it without pause, ever since. Did you hear that there’s a Scooby-Doo comic where they drive around in a van and solve mysteries, defeat monsters and criminals, and help people… but the world has gone to hell? Ooooh, scary. But, despite the fact that Scooby Apocalypse is almost bit for bit a standard Scooby experience with slightly different character designs, literally dozens of articles have tried to juice some “my childhood is ruined” by exaggerating and sometimes flat out lying about the comic. They play up the differences and not the much stronger and more consistent similarities between the comic and everything else Scooby-related you’ve ever seen. 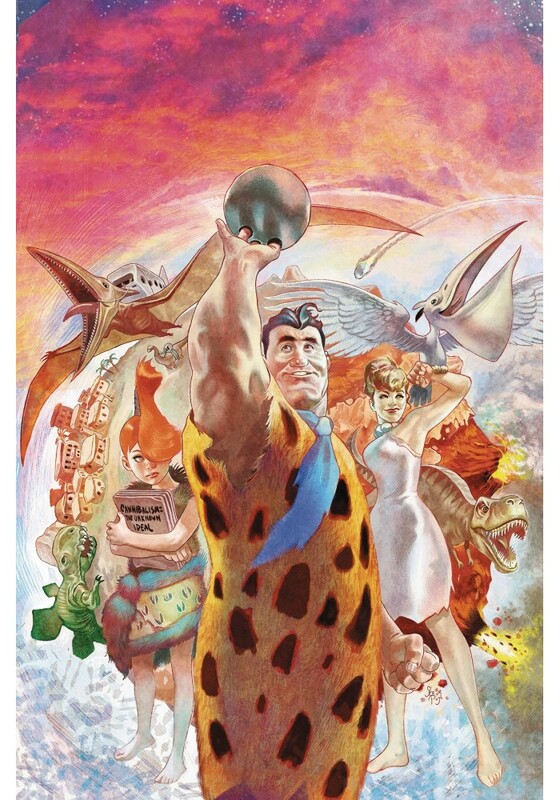 There is a Flintstones comic with awesome Steve Pugh art, that is hilarious, and sad, smart and contrarian, wacky as anything, and talks about modern American society by transplanting it into a cartoon stone age. Now, again, several articles have tried to get everyone to freak because this is so so soooooo different than the classic Flintstones. But, is it? 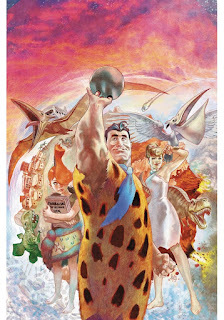 If you think it is, I have to ask: Have you ever watched an episode of The Flintstones? That is the show! The humor skews adult while there’s still child-appropriate silliness? That is the show! And, it’s the comic. Again, here, the biggest differences are the art style, which is still in-line with the take, but modernized, and that the references to modern-day technology, culture, and contemporary monster designs in movies are not the same as they were fifty years ago, because… the world doesn’t look like it did fifty years ago. If you’re just going to resurrect it and make the same unassumingly-sexist and erase-all-minorities jokes and plots from decades earlier… why even bother? 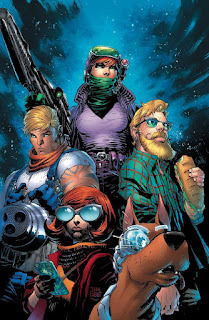 Some of the titles take the adaptation further from the source, others err on nostalgia hard, but what the panic ignores - or, more honestly, the media’s efforts to encourage a panic - is that even as DC publishes Scooby Apocalypse, they also publish two straight up, for kids, classic character designs Scooby comics. I know, “DC Publishes three Scooby-Doo comics, all pretty recognizable as Scooby-Doo, with two for all ages and one for older kids and teens!” isn’t going to get clicks the way, “DC ruins your life by making Scooby-Doo and his friends investigate monsters and they look mildly different!” But, simultaneously, let’s all admit that the first statement is both more honest and makes less people unnecessarily cranky.